HAZELWOOD, Mo. -- As Vladimir Tarasenko walked into the crowded room set up for his introductory press conference Thursday, the 20-year-old was in awe. The St. Louis Blues' prospect will need some time to get used to the NHL life -- which includes well-attended press conferences -- but getting Tarasenko here and getting him acclimated with his teammates is the first step, one he finally was willing to take after opting to leave the KHL for the NHL. Tarasenko, who was the 16th pick in the 2010 NHL Draft -- chosen two spots after the Blues selected Jaden Schwartz -- had 100 points in 176 KHL games spanning four seasons. The Past two were spent playing with Sibir Novosibirsk and SKA St. Petersburg. However, Tarasenko said it felt like the time was right to jump across the Atlantic Ocean and play in what he called the best league in the world. 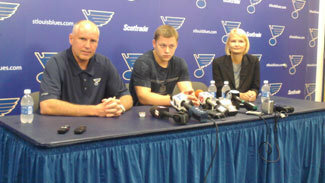 "I am very excited to be here in St. Louis, to be playing for the St. Louis Blues," Tarasenko said through a translator. "I am happy to help the team win the Stanley Cup this year. "I have received very good experience in the last two years in the KHL, and I believe this is the right time for me. I am ready to play in the best league in the world." The Blues, who won the Central Division last season, finished second in the Western Conference with 109 points and reached the second round of the Stanley Cup Playoffs, see Tarasenko as a top-nine forward. Blues general manager Doug Armstrong said he also believes the time is right for Tarasenko to make the transition. "We believe, and Vladi believes, that he's accomplished all the things necessary to become a player in the NHL," Armstrong said. "I know in talking to him over the last couple years, spending time with him and his [North American] agent [Mike Liut]. Everyone felt that the time was right for him to come over. We're very excited to have him here. "We think he has the chance to be a good player on a very good team. He's not someone that we expect to come in here and reinvent the wheel. We're not there now. Because of the great work that the players have done last year winning the division, getting 109 points ... we're just looking for another complement player [to come] in here to play. There's no pressure on Vladi to be something that he can't be. We're going to allow him to develop at his own time and come along at his own pace. "When we signed him we believed that he was NHL-ready. As I said to him before, now it's up to him to prove that. There's going to be great competition for ice time on this roster, and Vladi's excited … to fight for that ice." Part of fighting for that ice time is making Tarasenko feel as at ease as possible. His teammates are willing to oblige. "The most important thing is to make him feel comfortable off the ice, and especially on the ice," center Patrik Berglund, who was in Tarasenko's shoes not too long ago when the Blues drafted him No. 25 in 2006, said. "He's new. I know how it was. If you need help, I hope and he hopes that he asks for help so that we can help him. He looked really happy when he walked in. He didn't look shy or anything. He looks good." Veteran forward Jamie Langenbrunner, who along with Scott Nichol are the team's oldest players at 37, said, "You want him to feel comfortable. I think we have a group of guys to do that. It's a good locker room when it comes to that. It's a good group of guys. It's very welcoming, not cliquey at all. … Those things take time. He's got to learn what we're all about and we've got to learn what he's all about -- what buttons you can push, what buttons you can't. "I think he looks like a guy that just wants to fit in and be a part of the group. If he comes with that attitude, he's going to be a great addition to this room." Tarasenko, who signed a three-year entry-level contract that will pay him a base salary of $900,000 a season plus incentives, is a left-handed shot who prefers to play on his off-wing. He arrived in St. Louis on Friday and has been on the ice with his new teammates during informal workouts. "I can score. I get excited about scoring, but my main ambition is to help the team ... whatever it is that I do," he said. "I am playing for the best league in the world and I have seen my current team members on TV and have never played with them. Now I have an opportunity to play with them and learn from them. "My ambition is to do the best I can to help the team and also to prove to myself that I am capable of playing with the best players in the world. ... I am thrilled to be here." "My ambition is to do the best I can to help the team and also to prove to myself that I am capable of playing with the best players in the world. I am thrilled to be here." Blues fans who flocked here to the team's practice facility at St. Louis Mills this week anxiously have been awaiting Tarasenko's arrival. Many were seen wearing Tarasenko's No. 91 Sibir jersey, which was noticed by his new teammates. "Half the jerseys, you didn't know what they said. They were all in Russian," defenseman Ian Cole said. "That's a good sign that they're here. ... They're really kind of sending a jolt of excitement, a little electric shock through the fan base. "I think it's pretty cool." Tarasenko may be here now, but the possibility remains he could return to Russia. In the event of a lockout, Tarasenko could play with the Blues' American Hockey League affiliate, the Peoria Rivermen, or go back to the KHL. "We're going to talk about that," Armstrong said. "There's advantages in both, really. There's the advantage of staying in North America, playing with some of the players that he might play with [in St. Louis] if we don't start on time ... some of those players might be down in Peoria. Getting to understand the North American culture off the ice. Also playing on the smaller ice. But then going home, he's developed over there, he's become a very good player over there. I think it's going to be a win-win [situation], and whatever we jointly decide is best for him is the area we'll go. "With that being said, Vladi and I both talked, we're hoping the NHL and the NHLPA get something settled by Sept. 15 and this is a non-issue."